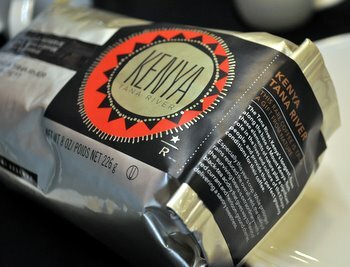 One of the Starbucks Reserve coffees that I tried at the tasting event the other day was the Kenya Tana River. This coffee is grown near the base of Mount Kenya by a network of small farmers that all grow coffee in the same rich area. It has a unique, but distinctly African (and I’m referring to African coffees here) flavor to it. It has a noticeable black tea flavor, a subtle grassy fruitiness and notes of berries throughout. Best of all, this coffee is incredibly smooth and balance. This makes it a coffee that literally anyone can enjoy. It also means that not only does it make a wonderful hot cup of coffee, but it also makes fantastic iced coffee without a hint of bitterness. The tea notes come out a little more strongly in the iced version, which makes it very refreshing. I drink it black both hot and cold, but I think that it would take very well to sweeteners, especially when served over ice. Our coffee master paired this coffee with orange cranberry stones, where the bright, tangy acidity of the orange and cranberries brightened up the coffee and highlighted the berry notes. I’d definitely match this with anything orange, but its smoothness and balanced flavor means that this is a coffee that would pair well with delicately flavored foods without overpowering them, so while it is a limited edition, it’s definitely an all purpose coffee.